This blog post originally appeared on the VMware Open Source Blog on March 5, 2019. Back in October, my colleague John Hawley and I reflected on our visit to last year’s U.S. CHAOSScon where we gave a talk on “The Pains and Tribulations of Finding Data.” At the end of that post, we mentioned learning more at the conference about Grimoire Lab’s Perceval tool for tracking data from multiple open source projects on a single dashboard. That opportunity helped me develop the work that was the subject of a talk I gave at the recent CHAOSScon Europe 2019. In my new presentation, I described a tool I’ve created to track the open source contributions of all the developers in VMware’s Open Source Program Office. The code itself isn’t open sourced at present, but its capabilities and outcomes will be of interest to any open source group hoping to better understand the open source contributions its members are collectively making. We’re also planning to use what we’ve learned to extend an existing open source metrics tool to make it more user centric. The idea for our contribution tracker grew out of a pretty straightforward need. Every engineer in our team was already tracking their open source contributions, but they were doing it by laboriously copying and pasting the information from every project they’d worked on. This easily took up an hour or more of their time every week. Then, our manager had to spend even more time compiling everything he’d been sent into a legible and useful report. 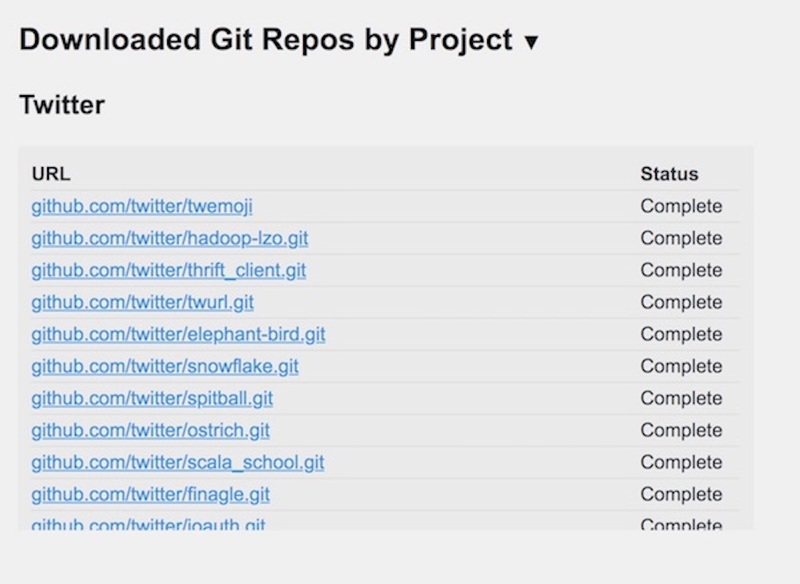 It does this by calling the GitHub API with a query about each of these data points for every engineer on our team. The data is stored in an SQLite database and then we use a small Python app to serve it to a web interface. Not everyone in our team works on GitHub based projects, of course, which is where Perceval comes in. In those cases, we use Perceval to access the git repository of each non-GitHub-based project our team members are working on and then search that data for their emails and/or usernames. 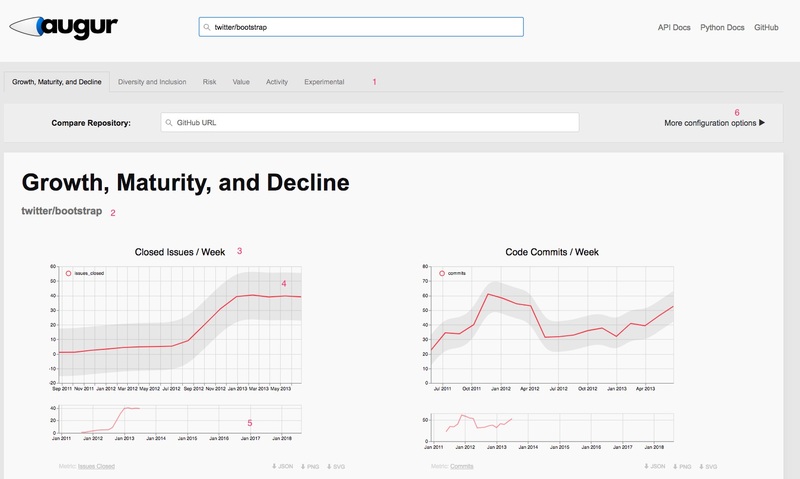 A user-specific view showing pull requests, comments, reviews and issues over a particular time period. 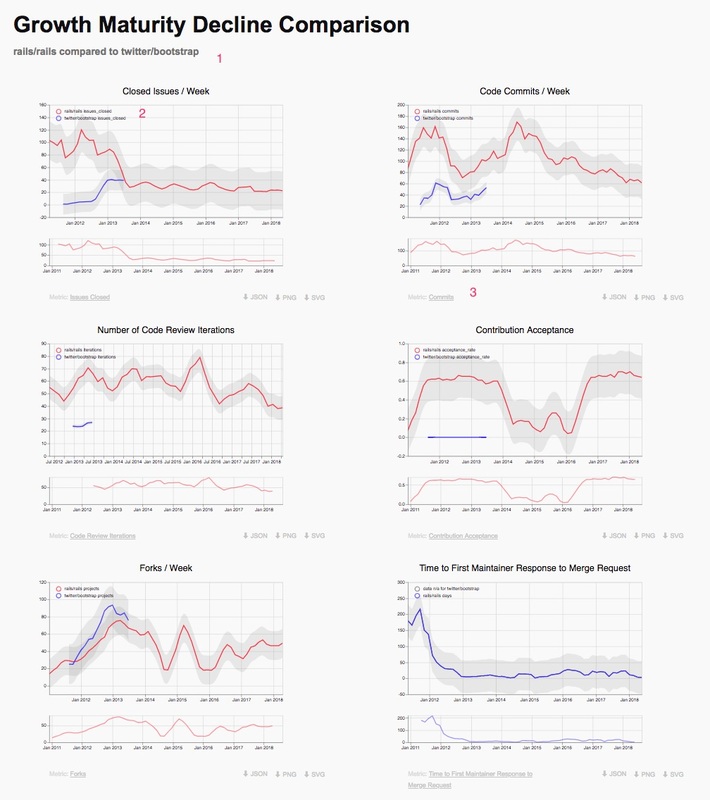 A summary view that lists all team pull requests, comments, reviews and issues over a particular time period. A projects and organization view showing all commits made by all team members on a specific project. A charts view showing the evolution of open source contributions over time. Crucially, the Tracker outputs data in the form of whole English sentences. Instead of just a number in a report, you see a set of sentences saying things like: “Alex C. committed [name] pull request” and so on, with links to every item worked on. The tool has already accomplished its primary goal by saving everyone on our team a ton of time. Now individual engineers don’t need to do any tracking of their own and all our manager has to do is open the tool, select the outputs they want, then copy and paste them into an email to distribute as needed. I wanted to share this story at CHAOSScon in case our experience was valuable to others. From the positive responses I received, it seems like it could well be. One concrete outcome is that, based on this work, we’re hoping to help extend the open source metrics tool Augur to offer user-based metrics. Augur comes out of Professor Sean Goggin’s lab at the University of Missouri and currently offers only project-centered metrics. Like GrimoireLab, Augur displays a series of metrics regarding a specific project hosted on GitHub. We found Augur to have a simpler user interface and a smaller barrier of entry than GrimoireLab’s. We’re also talking about adding the narrative capability developed for our internal tool to Augur – when you can output data in the form of legible English sentences, you make that data accessible to a wider range of potential users. In addition, I had a very positive conversation with the people who built Perceval, which helped me understand how we could optimize our tool to make maximal use of Perceval as we develop it further. The larger context of this work, and of my presentation, is that for-profit corporations are increasingly looking to build open source teams. Unsurprisingly, they want their employees to collect metrics that demonstrate the value they are adding to the sector. If we can make it easier for these teams to track their achievements, we’re helping build support from entities that have a lot of resources available to move open source forward. Stay tuned to the VMware Open Source Blog for future conference recaps and follow us on Twitter (@vmwopensource). By: Raniere Silva, Software Sustainability Institute, and Georg Link, University of Nebraska at Omaha. This post was originally published here and on Software Sustainability Institute blog . Open communities lack a shared language to talk about metrics and share best practices. Metrics are aggregate information that summarise raw data into a single number, stripping away any context of data. Pedagogical metric displays are an idea for metrics that include an explanation and educates the user on how to interpret the metric. Metrics are inherently biased and can lead to discrimination. Many problems brought up during the MozFest session are worked on in the CHAOSS project. Mozilla Festival, or MozFest, is an annual event organized by Mozilla volunteers to join thinkers and champions of the open internet. The event is located at the Ravensbourne University, Greenwich, London, United Kingdom, and hosts a safe space for attendees to talk about decentralization, digital inclusion, openness, privacy, security, web literacy and much more. At MozFest this year, we organised a 90-minute conversation on the topic of open community metrics and privacy. We seeded the conversation by sharing past examples (e.g., we are 1,000,000 Mozillians) asked our nine participants to discuss what it means to aggregate metrics for open communities and what impact this can have for (non-)members of these communities. The following sections elaborate on thoughts, ideas, and discussions from the session. What are Open Community Metrics? The MozFest conversation revealed that we are lacking a shared language for talking about open community metrics. Our session is indicative that the problem exists across open communities. Maybe it is because open community metrics have not been standardised, have not been around for long yet, or that every community has different ways of dealing with them. To resolve this, we discussed the meaning of what is an open community and what are metrics. We compared community to networks. A network consists of people who are connected to each other. In contrast, members of a community have a shared goal and purpose, often creating something together. Communities build a shared identity, and membership in the community is an alignment of one’s identity. Adding in the ‘open’, an open community is one that uses communication tools that displays the conversations to anyone who wants to inspect them. An open community does not always welcome everyone as a member (inclusive governance) but it operates in a transparent way. We contrasted metrics and data. Data is the raw information about who wrote a message to whom and what was the content of the message. The data needs to be enriched before it becomes information, such as how active a specific user is or how popular a certain topic is within the open community. Metrics are aggregates of those information and summarise the information into a single number or graph. Metrics is the information you would expect to see on a dashboard that summarises aspects of your open community. The commit contains Jane’s full name and email address. Even if Jane was a very private person and, except for their name and email, no other information about them was available online, we can narrow the search for the real person based on the Portuguese commit message, timestamp, and timezone. With access to other databases, we could enhance Jane’s profile more and with a higher degree of accuracy and precision. How can we protect Jane’s privacy when open source communities are collecting, processing, aggregating and analyzing data like the one that we describe? And how open source communities can stay true to their principles by making the data used on the analysis open (or FAIR – findability, accessibility, interoperability, and reusability) without violating Jane’s privacy? Now that we have a better shared understanding of what metrics are, we can discuss the intricacies of understanding the meaning behind metrics. A problem with metrics is that they only provide a single number or graph with no background information on how the data was collected, how it was summarized, and what were the intentions of the creators of a metric. This can lead to misunderstandings. For example, when number-of-messages is used as a metric to gauge popularity in a topic, then we need to understand how conventions unfold in an open community and the tool used. A tool that has thumb-up reactions or votings for messages provides a way to show interest in a topic and interact with messages; whereas the count of messages in a tool that is lacking those features and only has text messages (e.g. mailing lists) will be inflated because it counts simple “+1” messages. Another problem with metrics is that they are inherently biased. This runs counter to a popular belief that numbers are objective. At the foundation of metrics are data, which is biased because someone decided what data to collect and how to store it. The bias in data limits what information can be summarized by metrics. Furthermore, a metric reduces data to a single number or graph and as such removes detail and context. In this process, some data is weighted more than other data or not included at all. How data is summarized is determined by the metric creator, though what is done to the data is not obviously clear to a metric user. These problems point to a need of bridging between metric creator and metric user. A solution we discussed at MozFest is to provide an explanation with every metric. The person or team that prepares a metric for an open community would be responsible for including a description to help with interpreting the metric. We might call this concept of a metric that includes an explanation and educates the user on its use a ‘pedagogical metric display’. Open community metrics can be created by open communities about themselves, or by externals. Metrics created by people external to an open community have issues that stem from their external perspective. For example, they may not know the meaning behind interaction patterns of a community and as such may choose to summarize data that is not aligned with how the data came to be. Externals also might not be familiar with the goals and identity of an open community and thus create metrics that are misaligned. To resolve these issues, metrics might be better created by open communities. Pedagogical metric displays could bridge between internal metric creators and external metric users. An interesting question is why metrics are created for open communities. A small open community typically does not have metrics and we only observe metrics being introduced in large and growing communities. An intuitive answer could be that in a small community it is easier to maintain a sense of how the community is doing but in a larger community it becomes infeasible to keep track of everything at the interaction or data level and thus people aggregate the data to metrics to maintain this sense of knowing how a community is doing. A follow-on question is whether communities use metrics to understand themselves better, or whether communities use metrics to drive their growth. For example, knowing and ensuring that new users who make their first post in a community forum receive friendly welcome replies can help a community thrive. Conversely, a daily notification to maintainers that sums up how many new posters did not receive a reply within 48 hours is in itself not helpful because it only provides a negative metric without actionable insights. A question raised at MozFest is about creating and sharing metrics. By this, we mean the process of calculating a metric. For example, one open community might come up with a metric that serves the community well and other communities are interested in using the same metric for themselves. The immediate practical question is how metrics can be transferred between contexts and adapted for different tools that these communities might be using. An ideological question is whether the metric will actually be useful to the second community. Who is (Dis)Advantaged by Open Community Metrics? This section explores the implications of privacy in the context of open community metrics. First, anyone who participates in an open community can be tracked and profiled. A user may try to maintain a sense of privacy by using a pseudonym, a unique email address for each open community, and avoid revealing personal information. How successful these approaches are is subject to further study, but examples exist for failing to maintain privacy in online spaces. Another problem with open community metrics is how they are being used. A funding agency or other benefactor might want to see open community metrics that demonstrate impact or outcomes. This seems like a simple case where an open community that is tracking metrics and can show how it is producing outcomes or making an impact has a leg up in the struggle for financial support. Producing metrics could become a matter of making an open community sustainable. Other uses of metrics are also possible. An open community can use metrics to identify areas where community members are struggling. Identifying and fixing a bug in a community platform improves the experience. However, a problematic use of metrics could come from outside a community. What if a community of runners, who share their tracked routes, heart rates, best times, and who they ran with, was analysed by an insurance company to identify new ways to structure insurance policies for people who run regularly (and consequently discriminates against parts of the community). We have heard that membership in some open communities is a differentiating factor for job applicants. A developer with an active GitHub or StackOverflow profile could have a higher chance of landing a new job. Conversely, a user who posts pictures of drink parties in an open community could be disadvantaged in the hiring process. Granted, these are less issues of open community metrics and more about the data of open communities being available to external people. However, an open community can aid such discriminating use cases by providing metrics at the individual person level (ever wonder who looks at the green dots on GitHub and for what purposes?). The goal of metrics on the level of the individual might be to incentivize members of a community to participate more and behave in certain ways (e.g., avoid negative brownie points). But those same metrics could become signals and be used in unexpected ways. Naturally, people will begin to game a metric when it is displayed. With the assumption that open community metrics are used in decision making (e.g., hiring, insurance premiums, credit reporting, national citizen score, …) the people who do not participate in a community might be naturally disadvantaged. Some people may choose to avoid open communities and stay anonymous. However, some people are lacking internet access, do not speak (fluently) the dominant language in their community, or do not have the time besides job and family to participate. These people are disadvantaged for reasons outside of the open community and the use of metrics is unfair from the onset. The MozFest session was an exchange. We know from the participants that each of them took away something from the conversation. The central discussion points are summarized here. As facilitators, we see MozFest to be a mirror of the conversation that is happening in CHAOSS. With this blog post, we hoped to document some of the discussion and provide a baseline from which we can move forward. Many of the problems brought up in the MozFest session and documented here are problems that the CHAOSS project are working on (I know, shameless plug for CHAOSS). We are thankful to the attendees that help us to brainstorm open community metrics and privacy. This blog post originally appeared on the VMware Open Source Blog on October 9, 2018. Previously, we’ve explored the challenge of measuring progress in open source projects and looked forward to the recent CHAOSScon meeting, held right before the North American Open Source Summit (OSS). CHAOSS, for those who may not know, is the Community Health Analytics Open Source Software project. August’s CHAOSScon marked the first time that the project had held its own, independent pre-OSS event. For those who weren’t able to attend CHAOSScon and would like to see our talk, it’s now available for viewing here. We started with an overview of current solutions for gaining visibility into open source data and then outlined what we view as the challenges currently standing in the way of creating solid progress metrics for open source development. We’ll go back to the talk at the end of the post, but first, our overall takeaways. One thing we appreciated about having a dedicated CHAOSScon was that the event attracted a mix of longtime colleagues and collaborators as well as people new to the community. In particular, there was a strong presence from corporate open source teams. Engineers from Twitter, Comcast, Google and Bitergia shared how they have been tackling different kinds of open source data challenges. Hearing about their own trials and tribulations definitely seemed to validate our impression that we share a number of basic data measurement problems that are worth addressing as a community. It was good, too, to see CHAOSS welcoming these corporate perspectives. Open source conferences often eschew that kind of engagement, but it is useful to hear how teams are solving problems for themselves out in the wild. Here’s hoping that this marks the start of a new trend. A pair of workshops in the afternoon offered another useful takeaway. One was on “Establishing Metrics That Matter for Diversity & Inclusion” and the other was a report from the CHAOSS working group on Growth-Maturity-Metrics. It was clear from the latter workshop that we now have a good number of quantifiable data points to establish where a project is on the growth-maturity-decline continuum. But diversity metrics present a much trickier challenge. The data there exists mostly in mailing lists and board discussions and is currently only really explored through surveys. But the issue provoked a really interesting discussion full of smart suggestions and we’re excited to see what new solutions the community will come up with in the future. Turning to what we learned from our own panel, we were thrilled to be speaking in front of a similarly engaged audience. We opened with a shout out to the open source projects that have already created tooling around data acquisition and we were lucky enough to have maintainers from many of those projects in the room with us. It was good of our audience to indulge a presentation heavy on questions and light on answers. They seemed genuinely curious about the issues we were raising and interested in trying to figure out how to fundamentally address them – some even started working on potential solutions as we were speaking. We didn’t arrive at any grand consensus on solutions, but it’s clear that there is active community interest in trying to at least understand the problem of open source metrics and how we might be able to solve it. That’s certainly inspiring us to keep working on the issue—after all, things will only get better as more ideas get discussed, researched, tried and retried. This is not something we expect to be magically fixed in a couple of steps, but we’re excited to keep reaching out to the colleagues we interacted with at the conference and see what develops. Our final takeaway is a classic example of conference serendipity. 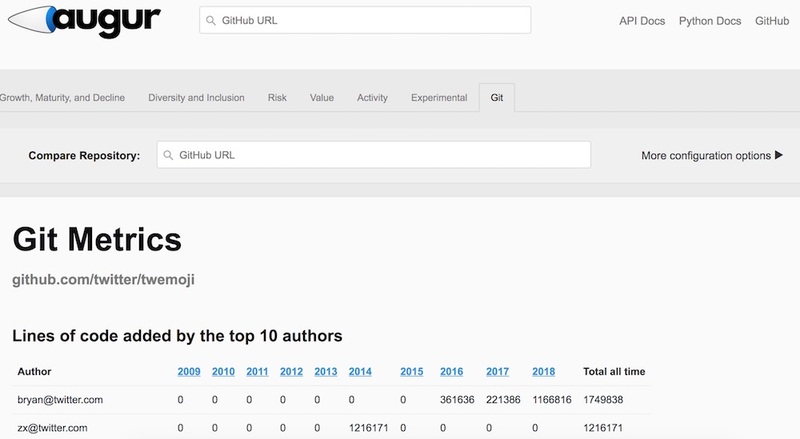 We arrived there knowing about GrimoireLab, a tool for tracking data about multiple open source projects on a single dashboard—we even referenced it in our talk. But what we didn’t know is that it’s easy to create your own implementation of it. We attended a presentation where several groups shared how they had implemented GrimoireLab with success and we’re now implementing it internally ourselves to track the status of our open source projects. Talk about a win-win situation. For open source professionals a “Blind Squirrel” is little more than the potential name for a Jazz trio, and probably not the right imagery for explaining to your boss that you’re “working on open source metrics”. Yet these blind squirrels will encounter nuts a LOT more often if we make more nuts! “Metrics are nuts!”. Not a good slogan, but that’s my metaphor. Making more metrics is easy for us because we have lots of data, we write software, and it stands to reason that more is going to generate more useful metrics. If you are the blind squirrel, its useful to find metrics. Useful: Of all the different things I find in the Ikea, many of them are useful. Or, there are 75 metrics on this dashboard, and 3 of them are useful! Helpful: You go into the endeavor with a goal, and leave with 3 metrics that help you achieve that goal. Or, you’re a blind squirrel that just ordered nuts online from Ikea. Open Source Software Health Metrics: Lets go Crazy! Lets Get Nuts! Goals: What are metrics going to help you accomplish? What are we trying to accomplish with metrics? With Augur? One of our goals is to make it easier for open source stakeholders to “get their bearings” on a project and understand “how things are going”. We think that’s most easily accomplished when comparisons to your own project over time, and other projects you are familiar with are readily available. Augur makes comparisons central. Something to hate. If you’ve ever been to an NHL game, you know that hating the other team is how we show our team we love them. Its also a good brainstorming device. We want the opportunity speak with you about your goals, use cases, and the failings of tools currently at your disposal for “getting there”. If you’re feeling adventurous, I would like to be able to reference our conversations (anonymously) in research papers, because research papers are kind of the “code of the academic world”. That’s less important. What individuals committed the most lines of code in a time period? From what companies or other organizations are the individuals who committed the most lines of code in a time period? Derivative of the first two: Is this changing? Did I lose anyone? Who can this project NOT afford to lose? Figure 1. When you follow the URL above, or your own URL, you will see a list of repositories that we have cloned, and using the technology behind “Facade”, a tool written by Brian Warner, calculated all the salient, basic, individual repository information about. Here’s a list of those repositories. When I look at the most basic data for one of my repositories, I have enough information to answer the most basic questions about it (See above). Figure 2 and Figure 3 illustrate the Augur pages you will see at the next level of “drill down”. Try clicking the months for even more information! Keep in mind this is ONLY the information for the repositories you shared with us, or the repositories part of one of our other live examples. Figure 2. You can see the lines of code from the top two authors, as well as the space inefficient Augur tool bar. Please contact me if you have tips and tricks for getting developers to be more comfortable with putting aesthetics behind utility in web page design. I will buy you a case of beer. 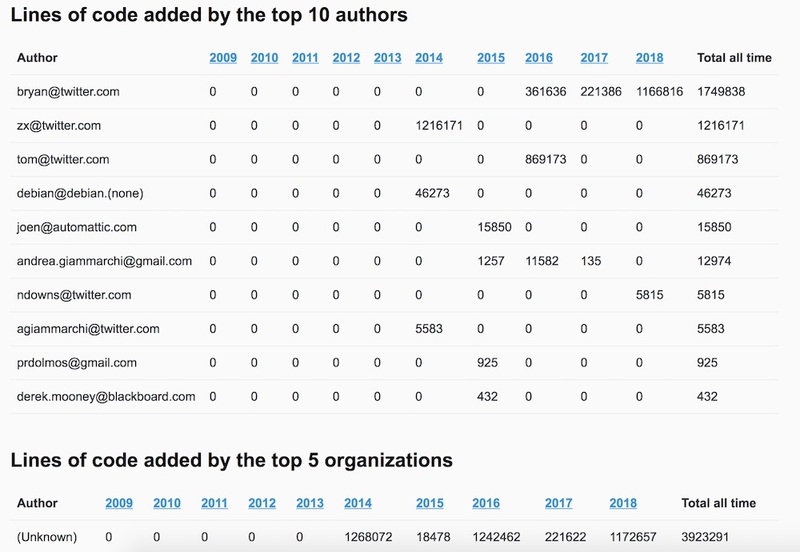 Figure 3 is a second image of the same page, but scrolled down just far enough to see that you can look at the top ten contributors as well as the top organizational contributors. We used a list of over 500 top level domains, as well as tech companies we were able to “guess” to start to resolve even these prototypes to specific companies. We did this because Amye asked us to, and we’re really gunning to make Gluster have more lustre. As if that’s possible. Figure 3. A more detailed look at some of the information available on a repository by repository basis in Augur. We also show you the organizational affiliation information. Figure 4. There’s a lot here. At the top of the screen you can enter an owner and a repository name to get information about a particular repository. Each of the CHAOSS Metric working groups are represented in tabs at the top of the screen (number 1). The repository you just searched for is listed below the metric category (number 2). The metric name is listed in the title (number 3), and that title corresponds with a CHAOSS metric that is linked below the graphic. These are line graphs, though other visualization styles are readily available, and the line over time is shown by (number 4). The gray area around (number 4) is the standard deviation. (Number 5) is a slider like you see on Google Finance, so you can zoom in on one period of time more closely. Finally, (number 6) has a LOT of different configuration and filtering options you can explore. Figure 5. Here is a WAY zoomed out overview of the Growth, Maturity and Decline metrics you might see on the Augur page. (Number 1) is where you might enter another “owner/repo” combination to compare your repository to. (Number 2) illustrates that sometimes there is no data available from the source we use for a particular metric.